In my recent cull of subscriptions to print media, BusinessWeek had no difficulty whatsoever in avoiding the chop. It consistently offers a useful and timely perspective on events in the world around me, and (subjectively) seems to intelligently consider the tech perspective on things more often than some of its competitors. 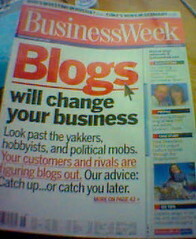 Last September, the BusinessWeek.com site rolled out the beta of a new service; Business Exchange. Closely linked to stories in the magazine and features on BusinessWeek.com, the Business Exchange is a fledgling social network within which members can access background material on stories, submit additional resources of their own, and comment on the content they find. Business Exchange links frequently feature prominently at the end of articles in the magazine, but I’m quite surprised at how rarely I find myself explicitly directed back into the magazine from the site. For a quick introduction, see this video of a recent presentation by BusinessWeek Executive Editor, BusinessWeek.com Editor in Chief (and active twitterer), John Byrne. According to BusinessWeek’s Director of User Participation, Ron Cassalotti, over 1,000 topics have been approved on the site since it opened four months ago. One of those (the Semantic Web, of course) was started by me, but I also consume and contribute content across a range of other topics relevant to my business interests. Much of this activity is relatively passive, but the site also offers the ability to grow a network of like-minded fellow members, to flag items of interest, and to comment on content shared by others. User profile and topic pages are visible to non-members, and also rank highly in Google; as Ron demonstrated by showing me how much higher my Business Exchange profile page ranks than my far older LinkedIn profile. Topics are suggested by BusinessWeek staff and by members of the site, and I get the impression that topics tend to be approved if the topic is in-scope (for BusinessWeek readers) and actively discussed out on the open Web. Ron tells me that there is no formal taxonomy for topics, which certainly makes it more straightforward for his team to adapt to evolving member interests and the shifting nature of the News. The lack of a formal taxonomy raises issues of its own, of course. I, for example, followed both ‘Cloud Computing‘ and ‘Cloud Computing Research.’ The former was proposed by Business Exchange member Ralph Perry, and the latter by BusinessWeek Senior Writer Stephen Baker in gathering background content to inform articles in the magazine. For a while I simply cross-posted content to both, but the numbers would suggest that Stephen’s topic is ‘winning,’ and attracting the eyeballs. Presumably at some point a back-end process (or one of Ron’s team) will make a decision to simply merge the two topics? The network – and its features – are clearly still evolving, and there’s a way to go. I do find myself on the site most days, though, exhibiting web site visiting behaviour that I thought I’d left behind years ago in favour of my RSS reader. Thanks to Ron and the team, and if you keep up the good work I’ll keep coming back. My next step, of course, is to move from being Featured User on the Business Exchange to getting my work printed in BusinessWeek itself. Then my social network-sceptical mum really will be impressed! Thanks for the great write-up of Business Exchange, Paul. As you noted, it is a continually modulating information source base upon the (business oriented) news-of-the-day and the actions of our users as they add (or take positive actions on content already there via search engines or other users) relevant content to benefit others who have a similar passion for the same topic(s). To reply to your twittered question, we track several user actions on each item and use a weighted algorithm to score both users and the articles/blog posts. We monitor those scores to not only determine top users or most valuable items in a topic (see the Most Active tab in each topic for human-vetted items of value) but also to determine gaming within the system. We also crowd-source user activity via a full reporting system and back-office moderation team. Feel free to tweet other BX questions to @bwbx or @roncasalotti, or e-mail me directly at ron_casalotti at businessweek dot com.